I have to say I jumped at the chance to review this Mini b bean bag –I’ve always rather liked them and had a suspicion the kids would feel the same – I wasn’t wrong! The Mini b beanbag is described as ‘compact, bijou and totally adorable’, we have found it to be fun, comfy and big enough for at least two, sometimes three little (and not so little) bottoms! It comes in a range of colours and is covered in a 2-way stretchable, breathable, water-resistant, durable and easy to clean PU fabric. Although we’ve only been road testing ours for a couple of weeks it has had plenty of road testing and still looks just as good as it did when I unwrapped it! Sitting obviously, plus a whole host of other activities, in our house so far – sharing stories, watching tv, throwing oneself on dramatically mid tantrum, staying up on for late night play station sessions, making into a bed, hiding underneath!! We love it! I was a little concerned that there might be arguments about whose turn it is on the bean bag but actually the little monsters like sharing it and there is plenty of room for both. It is really very comfortable and is does seem to mould to your body, feeling supportive but relaxing at the same time. I think it is an ‘investment’ bean bag with a price tag of £59.99 (it even comes in its own special bag), but it certainly seems to be excellent quality, the colour – lime green, is funky without being to garish and I can see it being popular with the whole family for a long time to come. A definite 9/10 – it only lost a tad because of the price, but if it lasts for a good while, maybe its worth this after all! 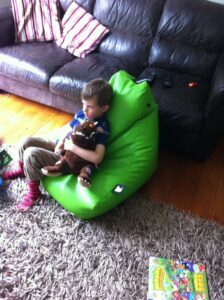 Our reviewer was provided with this bean bag for the purposes of review, all opinions are our own of course.